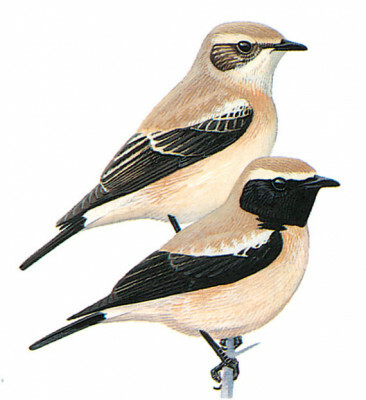 Easily told in flight from other similar-sized wheatears by almost wholly black tail (no large white patches at sides); otherwise male recalls black-throated form of Black-eared but black throat narrowly joined with narrower black wing area (shoulders not black as in male Black-eared); rump tinged buff. Sandy brown or grey-buff female often lacks black throat; may recall female Black-eared but always told by rump and tail pattern. Often perches on low vegetation or on ground; fairly shy.